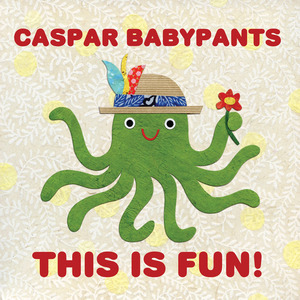 Cover of Caspar Babypants' latest album, This is Fun. Performer Caspar Babypants (a.k.a. Chris Ballew of the Presidents of the United States of America) is bringing an evening of music and classic movie shorts to nearby Mount Baker on Friday to raise funds and awareness for homeless kids. The fundraiser will benefit the Kids Helping Kids project through local agency Wellspring Family Services. The show is Friday, May 6, from 6:30 to 8:30 p.m. at the Mount Baker Community Club, 2811 Mount Rainier Dr. S. Tickets are $15 each for kids and adults (kids under age 2 are free), and are available online through Brown Paper Tickets or by phone at 206-902-4229. Doors open at 6 p.m. The ticket price includes popcorn, drinks, and treats. There will be a raffle for donated prizes. Goods will also be collected for the children of Wellspring. Donations needed are diapers and pull-ups, formula (Similac), and toiletries and first aid products such as toothbrushes, soap, lotion, shampoo, baby nail clippers, etc. Thanks to Melissa Jonas for providing us with this info!